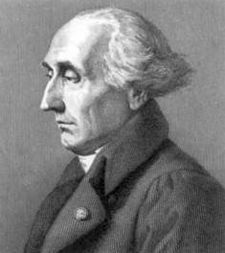 Joseph-Louis Lagrange, (January 25, 1736 – April 10, 1813) was an Italian who made major contributions to mathematics and physics, and was one of the world's greatest mathematicians. His most important work, Mécanique Analytique (“Analytical Mechanics”) liberated the science of mechanics from geometry by expressing the laws of motion in a form that could be manipulated algebraically without recourse to diagrams. Lagrange is also credited with the invention of the calculus of variations, the employment of which led to some of his most important mathematical discoveries. Lagrange was of French and Italian descent, and was baptized Giuseppe Lodovico Lagrangia five days after his birth in Turin (Sarton 1944). 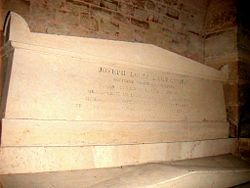 He was one of 11 children (only two of whom survived to adulthood) of Giuseppe Francesco Lodovico Lagrange, who was charged with the management of Kingdom of Sardinia's military treasury, and Maria Theresa Gros, the only daughter of a wealthy physician. Lagrange's father was of good social position and wealthy, but before his son grew up he had lost most of his property in speculations, and young Lagrange had to rely on his own abilities for his position. He was educated at the College of Turin, where he was first exposed to the study of mathematics under the heading of philosophy. In his first encounter, he had little interest in the subject, but having to return to the same class a second year, he tackled it with more energy, his interest in the subject having been excited due to a paper by Edmund Halley, which praised algebra over geometry as a tool of analysis. In his seventeenth year, he threw himself into mathematical studies and soon became adept in the field. At nineteen, he was made a mathematics lecturer at the Royal School of Artillary. The first fruit of Lagrange's labors here was his letter, written around 1854, to famed mathematician Leonhard Euler, in which he solved the isoperimetrical problem which for more than half a century had been a subject of discussion among mathematicians. What prompted Lagrange's letter was a statement by Euler in one of his memoirs leaving the solution of the problem to the "metaphysicians." Lagrange read the paper and his interest was awakened by Euler's unusual remark. The problem, stated simply in two dimensional form, was to find the form of a closed curve such as a loop of string which is able to encompass the maximum area for a fixed perimeter. To affect the solution, Lagrange employed what would later be named by Euler the calculus of variations, a new field which, although it had been applied piecemeal to particular problems, Lagrange developed in its greatest generality. Euler recognized the facility of the method adopted in the young Lagrange's letter, and its superiority to that used by himself; and with characteristic courtesy he withheld a paper he had previously written, which covered some of the same ground, in order that the young Italian might have time to complete his work, and claim the undisputed invention of the new calculus. This paper at once placed Lagrange in the front rank of mathematicians then living. In 1758, with the aid of his pupils, Lagrange established a society, which was subsequently incorporated as the Turin Academy, and most of his early writings are to be found in the five volumes of its transactions, usually known as the Miscellanea Taurinensia. Many of these are elaborate papers. The first volume contains a paper on the theory of the propagation of sound; in this he indicates a mistake made by Isaac Newton, obtains the general equation for the motion, and solves it for motion in a straight line. This volume also contains the complete solution of the problem of a string vibrating transversely; in this paper he points out a lack of generality in the solutions previously given by Brook Taylor, Jean le Rond d'Alembert and Euler, and arrives at the conclusion that the form of the curve at any time t is given by the equation . The article concludes with a masterly discussion of echoes, beats, and compound sounds. Other articles in this volume are on recurring series, probabilities, and the calculus of variations. The third volume includes the solution of several dynamical problems by means of the calculus of variations; some papers on the integral calculus; a solution of Pierre de Fermat's problem, to find a number x which will make (x²n + 1) a square where n is a given integer which is not a square; and the general equations of motion for three bodies moving under their mutual gravitational attractions. In 1761, Lagrange stood without a rival as the foremost mathematician living; but the unceasing labor of the preceding nine years had seriously affected his health, and the doctors gave him aids and refused to be responsible for his reason or life unless he would take rest and exercise. Although his health was temporarily restored his nervous system never quite recovered its tone, and henceforth he constantly suffered from attacks of severe melancholy. The next work he produced was in 1764 on the libration of the Moon, containing an explanation as to why the same face was always turned to the earth, a problem which he treated by the aid of virtual work. His solution is especially interesting as containing the germ of the idea of generalized equations of motion, equations which he first formally demonstrated in 1780. Soon after he set off on a visit to London, but on the way fell ill at Paris. There he was received with marked honor, meeting with prominent mathematicians of the time such as d'Alembert and Alexis Clairaut, and it was with regret that he left the brilliant society of that city to return to his provincial life at Turin. His further stay in the province of Piedmont was short, however. In 1766 Euler left Berlin, and Frederick the Great wrote to Lagrange expressing the wish of "the greatest king in Europe" to have "the greatest mathematician in Europe" resident at his court. This was the same year in which he was awarded a prize for his treatment of the motion of Jupiter's moons. Lagrange accepted Frederick's offer and spent the next twenty years in Prussia, where he produced not only the long series of papers published in the Berlin and Turin transactions, but his monumental work, the Mécanique Analytique. His residence at Berlin commenced with marital ties. Finding most of his colleagues married, and assured by their wives that it was the only way to be happy, he married. In spite of his devoted attention to her, however, his wife, who was a relative, soon died, being of frail constitution, as did a son born to the marriage. Lagrange was a favorite of the king, who used frequently to discourse to him on the advantages of perfect regularity of life. The lesson went home, and thenceforth Lagrange studied his mind and body as though they were machines, and found by experiment the exact amount of work which he was able to do without breaking down. Every night he set himself a definite task for the next day, and on completing any branch of a subject he wrote a short analysis to see what points in the demonstrations or in the subject-matter were capable of improvement. He always thought out the subject of his papers before he began to compose them, and usually wrote them straight off without a single erasure or correction. Over and above all the papers he composed while in Berlin was his great treatise, the Mécanique Analytique. In this he lays down the law of virtual work, and from that one fundamental principle, by the aid of the calculus of variations, deduces the whole of mechanics, both of solids and fluids. Lagrange followed the work of d'Alembert, who was the first to reduce the problems of motion to ones of statics through the principle of virtual velocities. By this principle, a system in motion is basically impressed with forces that will turn it into a static system, after which the forces and actual motions are determined. The object of the Mécanique Analytique is to show that the subject is implicitly included in a single principle, and to give general formulae from which any particular result can be obtained. The method of generalized coordinates by which he obtained this result is perhaps the most brilliant result of his analysis. Instead of following the motion of each individual part of a material system, as d'Alembert and Euler had done, he showed that, if we determine its configuration by a sufficient number of variables whose number is the same as that of the degrees of freedom possessed by the system, then the kinetic and potential energies of the system can be expressed in terms of those variables, and the equations of motion thence deduced. Amongst other minor theorems here given it may mention the proposition that the kinetic energy imparted by the given impulses to a material system under given constraints is a maximum, and the principle of least action. All the analysis is so elegant that Sir William Rowan Hamilton said the work could only be described as a scientific poem. It may be interesting to note that Lagrange remarked that mechanics was really a branch of pure mathematics analogous to a geometry of four dimensions, namely, the time and the three coordinates of the point in space; and it is said that he prided himself that from the beginning to the end of the work there was not a single diagram. At first no printer could be found who would publish the book; but Abbe Marie finally found a bookseller who would underwrite the printing, provided the author assumed half of the losses if the book did not sell. Adrien-Marie Legendre oversaw corrections to the work before it was printed in 1788. Frederick the Great died in 1787, and Lagrange, who had found the climate of Berlin trying, gladly accepted the offer of Louis XVI to migrate to Paris. He received similar invitations from Spain and Naples. In France he was received with every mark of distinction and special apartments in the Louvre were prepared for his reception, and he became a member of the Academy of Sciences, which later became part of the National Institute. At the beginning of his residence in Paris he was seized with an attack of the melancholy, and even the printed copy of his Mécanique on which he had worked for a quarter of a century lay for more than two years unopened on his desk. Curiosity as to the results of the French Revolution first stirred him out of his lethargy, a curiosity which soon turned to alarm as the revolution developed. It was about the same time, 1792, that the unaccountable sadness of his life and his timidity moved the compassion of a young girl who insisted on marrying him, and proved a devoted wife to whom he became warmly attached. Although the decree of October 1793 that ordered all foreigners to leave France specifically exempted him by name, he was preparing to escape when he was offered the presidency of the Commission for the Reform of Weights and Measures. The choice of the units finally selected was largely due to him, and it was mainly owing to his influence that the decimal subdivision was accepted by the commission of 1799. In 1795, Lagrange was one of the founding members of the Bureau des Longitudes. Though Lagrange had determined to escape from France while there was yet time, he was never in any danger; and the different revolutionary governments (and at a later time, Napoleon) loaded him with honors and distinctions. A striking testimony to the respect in which he was held was shown in 1796 when the French commissary in Italy was ordered to attend in full state on Lagrange's father, and tender the congratulations of the republic on the achievements of his son, who "had done honor to all mankind by his genius, and whom it was the special glory of Piedmont to have produced." It may be added that Napoleon, when he attained power, warmly encouraged scientific studies in France, and was a liberal benefactor of them. Lagrange managed to avoid the ire of the revolutionary factions and of Napoleon's administration in France by remaining aloof from politics throughout his previous service, and by a imposing upon himself a measure of restraint in the expression of political beliefs. Even so, he made plans to leave Paris for Berlin after the execution of Antoine Lavoisier, but developments in Paris persuaded him to remain there. In 1795, Lagrange was appointed to a mathematical chair at the newly-established École Normale Supérieure, a teacher-training institution which enjoyed only a brief existence of four months. His lectures here were quite elementary, and contain nothing of any special importance, but they were published because the professors had to "pledge themselves to the representatives of the people and to each other neither to read nor to repeat from memory," and the discourses were ordered to be taken down in shorthand in order to enable the deputies to see how the professors acquitted themselves. On the establishment of the École Polytechnique in 1797, Lagrange was made a professor; and his lectures there are described by mathematicians who had the good fortune to be able to attend them, as almost perfect both in form and matter. Beginning with the merest elements, he led his hearers on until, almost unknown to themselves, they were themselves extending the bounds of the subject. Above all, he impressed on his pupils the advantage of always using general methods expressed in a symmetrical notation. His lectures on the differential calculus form the basis of his Théorie des fonctions analytiques which was published in 1797. This work is the extension of an idea contained in a paper he had sent to the Berlin papers in 1772, and its object is to substitute for the differential calculus a group of theorems based on the development of algebraic functions in series. A somewhat similar method had been previously used by John Landen in the Residual Analysis, published in London in 1758. Lagrange believed that he could thus get rid of those difficulties, connected with the use of infinitely large and infinitely small quantities, to which philosophers objected in the usual treatment of the differential calculus. The book is divided into three parts: of these, the first treats of the general theory of functions, and gives an algebraic proof of Taylor's theorem, the validity of which is, however, open to question; the second deals with applications to geometry; and the third with applications to mechanics. Another treatise on the same lines was his Leçons sur le calcul des fonctions, issued in 1804. These works may be considered as the starting-point for the researches of Augustin Louis Cauchy, Carl Gustav Jakob Jacobi, and Karl Weierstrass. The theory of planetary motion had formed the subject of some of the most remarkable of Lagrange's Berlin papers. In 1806 the subject was reopened by Simeon Poisson, who, in a paper read before the French Academy, showed that Lagrange's formulae led to certain limits for the stability of the orbits. Lagrange, who was present, now discussed the whole subject afresh, and in a letter communicated to the Academy in 1808 explained how, by the variation of arbitrary constants, some important characteristics of any system of mutually interacting bodies could be determined. In 1808, Napoleon made Lagrange a drand officer of the Legion of Honor and a comte of the empire. In 1810, he commenced a thorough revision of the Mécanique Analytique, but he was able to complete only about two-thirds of it before his death. He was awarded the Grand Croix of the Ordre Impérial de la Réunion in 1813, a week before his death in Paris. JOSEPH LOUIS LAGRANGE. Senator. Count of the Empire. Grand Officer of the Legion of Honor. Grand Cross of the Imperial Order of Réunion. Member of the Institute and the Bureau of Longitude. Born in Turin on 25 January 1736. Died in Paris on 10 April 1813. A street in Paris is named rue Lagrange in his honor. In Turin, the street where the house of his birth still stands is also named via Lagrange. Although many portraits of Lagrange were executed after his death, Lagrange himself was said never to have permitted a portrait to be drawn of him during his lifetime. In appearance he was of medium height, and slightly formed, with pale blue eyes and a colorless complexion. In character he was nervous and timid, he detested controversy, and to avoid it willingly allowed others to take credit for what he had himself done. In society, he was often absent-minded, his thoughts drifting from the immediate company, most likely to his latest mathematical meditations. This absent-mindedness occurred also while he taught, where, in the middle of a lecture, he would repeat one of his favorite phrases, "I don't know," and his audience would wait in perfect silence until his thoughts returned to the reality of the moment. Lagrange's constitution was weak, and he kept to a steady diet consisting mainly of vegetables. He often said that, had not he been confronted with financial challenges, he would never have pursued a mathematical career. He, in fact, believed that financial adversity was a great impetus to accomplishment. He was very fond of the mathematics of his predecessors, and recommended their reading above the latest-published mathematical works, whose massive volumes often intimidated him. Among those mathematicians who he most highly regarded were Euler and d'Alembert. Lagrange will always be known among the greatest mathematicians, primarily for his analytical expression of the science of mechanics, which, after his major work on this subject was published, was no longer bound by awkward geometrical considerations. Everything in mechanics could be reduced to the manipulation of the variables that defined a particular problem. His analysis replaced that of Isaac Newton with a more general principle that had much wider applicability. Scientists of the eighteenth century quickly realized that they would need more powerful tools to solve problems in mechanics than the Newtonian approach provided, and these were supplied by d'Alembert, and more particularly by Lagrange in his Analytical Mechanics. His work would later be expanded upon by other investigators, most particularly by the British mathematician William Rowan Hamilton. Lagrange's invention and use of the calculus of variations became a field in itself, and a powerful tool for the physicists and mathematicians that followed him. During the 22 years he spent at the court of Frederick the Great, not only did Lagrange produce his splendid Mécanique Analytique, but he contributed between one and two hundred papers to the Academy of Turin, the Royal Academy of Berlin, and the Académie Française. Some of these are really treatises, and all without exception are of a high order of excellence. Except for a short time when he was ill he produced, on average, about one paper a month. Of these, note the following as amongst the most important. First, his contributions to the fourth and fifth volumes, 1766–1773, of the Miscellanea Taurinensia; of which the most important was the one in 1771, in which he discussed how numerous astronomical observations should be combined so as to give the most probable result. And later, his contributions to the first two volumes, 1784–1785, of the transactions of the Turin Academy; to the first of which he contributed a paper on the pressure exerted by fluids in motion, and to the second an article on solving problems in calculus by using infinite series. Most of the papers sent to Paris were on astronomical questions, and among these one ought to particularly mention his paper on the Jovian system in 1766, his essay on the problem of three bodies under the influence of their mutual gravitational attraction in 1772, his work on the orbit of the Moon in 1773, and his treatise on cometary orbits in 1778. These were all written on subjects proposed by the Académie Française, and in each case the prize was awarded to him. His papers on the general process for solving an algebraic equation of any degree, 1770 and 1771; this method fails for equations of an order above the fourth, because it then involves the solution of an equation of higher dimensions than the one proposed, but it gives all the solutions of his predecessors as modifications of a single principle. The complete solution of a binomial equation of any degree; this is contained in the papers last mentioned. His proof of the theorem that every positive integer which is not a square can be expressed as the sum of two, three or four integral squares, 1770. His proof of Wilson's theorem that if n is a prime, then (n − 1)! + 1 is always a multiple of n, 1771. His papers of 1773, 1775, and 1777, which give the demonstrations of several results enunciated by Fermat, and not previously proved. He was the first to prove that Pell's equation always has a solution. There are also numerous articles on various points of analytical geometry. During the years from 1772 to 1785, he contributed a long series of papers which created the science of partial differential equations, which treats cases where the rate of change of a function with respect to two or more independent variables must be taken into account. A large part of these results were collected in the second edition of Euler's integral calculus which was published in 1794. Attempting to solve the three-body problem resulting in the discovery of Lagrangian points, 1772. On the secular equation of the Moon, 1773, noticeable for the earliest introduction of the idea of the potential. The potential of a body at any point is the sum of the mass of every element of the body when divided by its distance from the point. Lagrange showed that if the potential of a body at an external point were known, the attraction in any direction could be at once found. The theory of the potential was elaborated in a paper sent to Berlin in 1777. Two papers in which the method of determining the orbit of a comet from three observations is completely worked out, 1778 and 1783. His determination of the variations of the elements of the planets, 1781-1784: the upper limits assigned for these agree closely with those obtained later by Le Verrier, and Lagrange proceeded as far as the knowledge then possessed of the masses of the planets permitted. ↑ Lagrange did not have a doctoral advisor but academic genealogy authorities link his intellectual heritage to Leonhard Euler, who played the equivalent role. Grant, Robert. 1852. History of Physical Astronomy: From the Earliest Ages to the Middle of the Nineteenth Century, 51-57. London: Henry G. Bohn. Sarton, George. 1944. Lagrange's Personality. Proceedings of the American Philosophical Society 88: 457. Thomson, Thomas, ed. 1813. Annals of Philosophy, Or, Magazine of Chemistry, Mineralogy, Mechanics, Natural History, Agriculture and the Arts 2:1-5. London: Robert Baldwin. Thomson, Thomas, ed. 1814. Annals of Philosophy, Or, Magazine of Chemistry, Mineralogy, Mechanics, Natural History, Agriculture and the Arts 4:1-10. London: Robert Baldwin. Young, Thomas. 1855. Life of Lagrange. Miscellaneous Works of the Late Thomas Young 2:557-582. London: John Murray. This page was last modified on 6 June 2018, at 21:24.